Interested in Spelt? 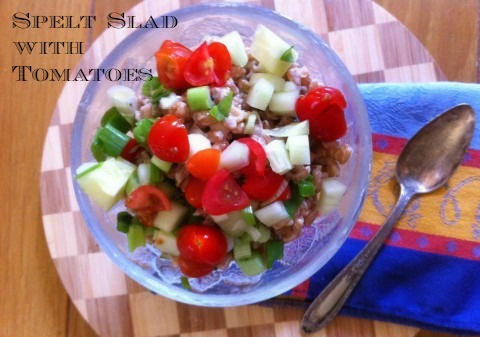 Try this salad and you will be sold on it’s flavor and simplicity. Spelt is an ancient grain that has a mellow nutty flavor, and a higher protein content than wheat. Naturally high in fiber and complex carbohydrates which makes it easier to digest. Spelt flour can be substituted for regular flour, and can be used in pizzas, flatbreads, cookies, and cakes. Soups, pastas, and salads can be enhanced with cooked spelt for a healthful alternative. It’s best if soaked overnight. For a quicker method try using a pressure cooker. It also can be cooked in a large pot for 50-60 minutes. For a quick meals, spelt can be cooked ahead of time and placed in the refrigerator covered for up to a week. Spelt's nutty flavor, with added fresh vegetables and tahini dressing makes this salad a winner. Soak beans overnight. Cook beans in fresh new water for 45-50 minutes, or until tender. In a deep pot add cold water and spelt and bring to a boil. Reduce the heat to simmer, for 1- 1½ hours. Once cooked, spread on a sheet pan or large bowl add 1-2 tablespoon olive oil and stir. Let cool before adding vegetables and dressing. Wash and chop all the vegetables and place in a large bowl. Put the vinegar in a small bowl and whisk in olive oil slowly. Whisk in tahini and herbs. This salad can be prepared the night before, therefore it's perfect for a party or outdoor BBQ. This salad can be adjusted to your taste by adding your favorite fresh vegetables. This recipe is adapted from Fine Cooking Magazine. Mmmm! Looks great! I love the sound of that dressing! Great meeting you at Camp Blogaway! Thank-you and let’s stay connected! Love your site! I didn’t know the answer so I googled it and found this! Farro (emmer wheat) and spelt are not the same thing, as this New York Times essay amusingly points out. While farro cooks like pasta, high-protein spelt needs waaaay more time and love to become edible. So what is spelt, that oft-mocked hippie grain, good for? Apparently those brick-like 1970s “health loves” have gone the way of the Earth Shoe, and the new generation of spelt bread is like wheat bread but with a tougher crust. And spelt flour can be made to make genuinely edible pancakes, pizza dough, pasta and crackers as well. Plus, for those of you concerned with organic foods, spelt is easier to grow without pesticides. The essay includes recipes for spelt-flour crackers, and mushroom farro (no, you can’t substitute spelt). So happy that you are at the new Encinitas Farmers Market! This salad tasted so good that I insisted on bringing it to our Mother’s day gathering (despite being told it was my day and I shouldn’t cook). Only thing that bummed me out was not having any leftovers to take home – it was devoured by everyone. My 10month old kept squealing for more.